Michigan's Upper Peninsula provides plenty of gunning for hunters in-the-know. Waiting for the next command. Michigan is divided into two distinct peninsulas surrounded by four of the five Great Lakes. Spanning five miles, the magnificent Mackinac (pronounced Mackinaw) bridge connects Lower Michigan to the Upper Peninsula (U.P.). Better than 90-percent of Michigan's population is located below the bridge in the Lower Peninsula. The sparsely populated U.P. 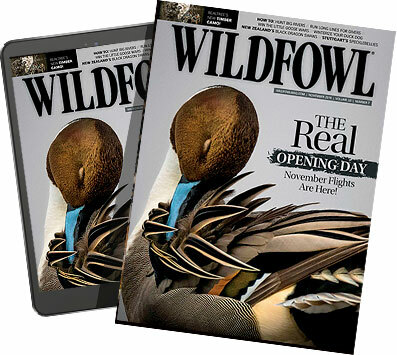 is a sportsman's paradise containing world class waterfowling opportunities galore. Access to the action is awesome as Michigan holds more lands open to public hunting than any other state east of the mighty Mississippi, and most of it is located in the U.P. The U.P. also boasts a staggering amount of waterfowl habitat, so immense that a hunter could spend his or her entire lifetime hunting different spots without covering all the honey holes. People that live in the U.P. are commonly referred to as "Yoopers" and those that live in Lower Michigan are often called "trolls" by Yoopers because they live below the bridge. My waterfowling buddy, Tom Gudwer, is a third generation Yooper who has been treading through the central U.P. for his entire life. The U.P. experiences some of the most brutal winters in the lower 48, with snowfalls in some areas averaging over a staggering 300 inches annually. As you can imagine, Yoopers, especially people like Tom that work and play outdoors year round, can endure just about any fowl weather conditions without batting an eye. As we set up a spread of goose decoys, it was so dark you couldn't see your hand in front of your face. The rain poured down with a vengeance making the oat stubble field a mixture of mud and puddles. The cloud deck was so low that we could literally reach up and touch it. It was cold, a wet kind of cold that penetrates to the bone. Tom went about his business ignoring the weather. I'll admit that I was complaining a little as my Gore-Tex duds were being tested to the max. We strategically put out two dozen full bodied goose decoys, a couple dozen shells and a bunch more silhouettes to round out the spread. Two layout blinds were positioned on the down-wind end of the setup. We had scouted the fields and set up right where thousands of geese had used the field the previous day. Thousands of feeding geese leave thousands of piles of goose dung, so let you imagination fill in the blanks on how that muddy field smelled. As the darkness stubbornly gave way to a slate gray sunrise, the sound of honking geese punched through the fog and rain. Honkers moving down the Great Lakes' shoreline. Despite our pleading calls and vigorous flagging, the first flight skirted our setup and landed about 200 yards away. The visibility was so poor that the geese just couldn't see us. Before Tom could fret too much another flock poured in and this one took notice of my call and banked our way. At over 50 birds strong, they looked like a squadron of B52s as they locked their wings and kicked out their feet on approach. Their excited honking was rudely interrupted as our blinds popped open and we drew beads on the shocked looking giant Canada geese. Our volley of shotgun music sent two of them tumbling to the soggy ground. Tom's dog Oscar shot out from his hide like a cruise missile and retrieved each bird. The dog thought the weather was perfect as he splashed though the field throwing rooster-tails in his wake. Five minutes later and another flock buzzed our dekes. There squawking calls identified them as cackling geese, a smallish sized subspecies of Canada geese. Several flights of cacklers buzzed us along with flocks of lessers and giants. Limiting out on a mixed bag of honkers was as easy as pie. As we picked up the spread, geese were still pouring into the field. It dawned on me that I'd forgotten all about the cold and rain. It's funny how a few thousand geese will turn misery into pure joy. As it turned out the weather was perfect. The U.P. is graced with a robust local population of giant Canada geese. Faye McNew, the Waterfowl Specialist for the Michigan DNR states, "The U.P. has a resident giant Canada goose population that numbers around 30,000 during the spring. During years with good hatches, that number swells to over 100,000 by fall. Those resident goose numbers have been stable in recent years. The U.P. also gets some shipments of transplanted nuisance geese from southern Michigan. Those birds are captured during molting season and relocated from urban areas to the wilds of the U.P. where they bolster local populations without causing conflicts with humans." During the fall, the Mississippi Valley Flyway (MVF) infuses the U.P. with hundreds of thousands of migrating Canada geese. The interior Canada geese of the MVF nest primarily in northern Ontario, especially the Hudson Bay Lowlands, west of Hudson and James Bays. MVF giants nest mostly in southern Ontario and in the upper Midwest. A 2006 survey showed that the MVF had over 384,000 nesting pairs, an 11-percent increase from 2005 and the most recorded since 1999. Faye McNew said, "The MVF geese are made up of four distinct subspecies and all of them pass through the U.P. They are: giants (Branta canadensis maxima), interiors (B.C. interior), lesser (B.C. parvipes) and Richardson's Canada geese (B. c. hutchihsii). Richardson's are commonly referred to as cackling geese. Giants and interior subspecies make up more than 99-percent of the Canada geese in the MVF." McNew went on to say, "Interiors typically migrate through the U.P. in peak numbers during Mid-September; however weather in the nesting grounds can really influence the timing of those migrations." When the migrations are peaking, it's not uncommon too see flock after flock of flight birds pouring through the area. It can really provide some world class hunting action." e, it's hard to count them, but we estimate that there are upwards of 17,000 nesting woodies in the U.P. Hunters can also find good numbers of blue winged teal, buffleheads and other waterfowl species, too. Due to habitat loss, the once numerous black ducks continue to decline and now only number about 500 nesting pairs in the U.P. McNew concluded, "Diving ducks are very numerous in the U.P. during the fall, however most of them nest in Canada." A short rest after a long retrieve. Last year I hunted the opening day of waterfowl season along a scenic river on public land. Despite easy access, in over 10 openers there, I've never encountered another hunter. I simply position myself in some brush on a point where the large river narrows, throw a dozen decoys out, and then sit back and enjoy the action. This river gets a consistent early morning flight of wood ducks and mallards during the first week of the season. I have never failed to take my limit from that spot. Last year I took my limit there so fast I was glad I'd brought a rod and reel along because the fish were biting there, too. It doesn't get much better than a lunch of fresh trout and wood ducks on opening day. I have worn out several DeLorme Michigan atlases and gazetteers. Their topographic map books are a great source for freelance water fowlers showing roads, trails, public land, streams and lakes along with other details such as floodings and noted waterfowl areas. The U.P. has hundreds, if not thousands of streams draining it, and beavers occupy most of them. Beaver ponds are one of my favorite places to find good numbers of U.P. ducks. I locate them by first finding streams on my Gazetteer and then I use the Internet to find the ponds. Go to maps.yahoo.com and zoom in on your area of interest. Click on "Satellite" to see an aerial and pan around to examine streambeds for ponds. I like to key in on areas where beavers have made a series of dams. One can either just jump shoot the ponds or better yet use a pushing technique to really tear up the birds. Positioning one person at a strategic funnel along the stream. He's the blocker. Have another hunter jump shoot a series of ponds upstream from the blocker. The pusher or jump shooter will get some action, but if properly positioned, the blocker will often heat up his barrel picking off ducks that are pushed down stream. This hunting technique takes plenty of planning and strategy, and often takes hunting a location twice to pattern the birds' escape routes. Hunting on inland lakes is another favorite tactic in the U.P. There are thousands of small, medium and large sized inland lakes peppering the U.P. and most of them have public access and good numbers of ducks and geese at times. The best lakes will feature marshy areas. Many provide shore bound hunters with some good opportunities, but having a small boat or canoe will open up the possibilities immensely. There are dozens of rivers in the U.P. that hunters can float for waterfowl. The best hunting along rivers will be during the early fall when wood ducks are abundant. Woodies typically migrate out with the first artic blasts, which in the U.P. typically occur during mid-October. The U.P. has hundreds of miles of Great Lakes shorelines and bays that offer unique water fowling opportunities. By law, Great Lakes shorelines, to the high water mark, are open to public access. I annually hunt Lake Michigan and Lake Huron shorelines and have experienced phenomenal success when the conditions are right. I sometimes make a simple hide by piling up shoreline debris, but have also had good success using layout binds or a combination of both. Some areas I hunt are strewn with large boulders where I just sit against a big rock. I often use camo netting and native, dead grass for additional concealment. The key is to pick a shoreline where the wind is blowing offshore. Ducks and geese will be drawn to such shorelines in mass during a big blow. I like to set my decoys right along the shoreline so that half are in the water and half are on shore. The U.P. offers some of the best diver duck hunting in the world. The main technique for hunting divers though is layout hunting on the open water. This involves a specialized, low profile boat paired with a larger tending boat. Large rafts of decoys are deployed from the tender boat, which also tows the layout boot into position. The layout boat is anchored and one or two hunters hunt from them. The tender waits in the distance and when signaled, comes to pick up dead birds and switch out hunters. It is a very cool way to hunt ducks and the method has a small, but strong following in the Great Lakes Region. Rex Ainslie (906-293-5131) is an Eastern U.P. district biologist and a waterfowl specialist for the Michigan DNR. Ainslie says, "For good reason, the St. Mary's River system is the most popular water fowling destination in the U.P. That system encompasses a vast assortment of shorelines, marshes, bays and open waters that draws water fowlers from all over the country. Munuscong Bay and Potagannissing Bay are two of the most noted areas on the St. Mary's system. These bays are quite large. There are lots of resorts on those bays that cater to waterfowlers. "Some other good traditional areas for consistent success are the Autrain Basin near Munising, Blind Sucker Creek flooding by Grand Marais and the Dollarville flooding located close to Newberry are all good bets. Big and Little Manistique Lakes have good numbers of waterfowl, but the lakes are quite large. There are dozens of smaller hotspots consisting of floodings, and marshes that are listed on a DeLorme Map Book. One of my favorites is the Cranberry Lake Impoundment. Most smaller spots will get some pressure on the opening weekend, but after that you'll likely have the spots all to yourself. St. Martins Bay and all the Lake Huron and Lake Michigan waters around St. Ignace have fantastic diver duck hunting. There are lots of farms in the Eastern U.P. and gaining permission to hunt fields for geese and ducks is often possible with nothing more than a cordial request. The best field locations will feature freshly harvested oats." Rob Aho is a Michigan DNR Wildlife Biologist and also a native Yooper who specializes in water fowling in the western U.P. "One of the best areas for water fowl in my district is the Baraga Plains, Aho said. This large area has floodings, fields and food plots managed for waterfowl and other game. The area has a good population of resident giant Canada geese that gets regularly infused by transplants of nuisance geese transported there from southern Michigan. MVF geese also use the Baraga Plains heavily during their migrations. Last year the migration peaked around September 18. Another good spot is the Sturgeon River Sloughs State Wildlife Management Area, which has a mixture of fields, marshes, floodings and sloughs. Portage Lake and the Portage River near Hancock provide good duck and goose hunting. This area gets pounded pretty hard on the opener, but after that it's mostly ignored. It seems like more migrating birds move in later in the season too. g ducks and the best part is that very few hunters take advantage of it. It is legal to hunt just about anywhere on the Great Lakes as long as you are at least 450' away from buildings. Lake Gogebic is loaded with ducks, especially on the marshy, south end of the lake." Aho, continued, "The western U.P. is loaded with rivers that hunters can float for some high quality duck hunts. The Sturgeon River from M38 to Portage Lake is a good float. The upstream portion of the Presque Isle River is also a good bet. The Montreal, Escanaba and Menominee Rivers are also prime for a float trip. The Gnat River and the Gnat River flooding is another great spot to check out. Most of the farm lands that hold good numbers of geese are in the southern portion of the western U.P." Because deer numbers are very high in those areas and leasing deer hunting ground is getting very popular, gaining permission to hunt geese there is getting pretty tough. Your best bet to gain permission to hunt farm fields is during the early September seasons before deer season starts in October.